There's Nothing QUIET Like It...The only Single-Story, ALL-Inclusive property in the area! The Joy of Award - Winning Living! Abby Glenn's convenient location offers you the best of both worlds. The property is "on the road less traveled," i.e., we are situated on quiet West Dublin Drive, yet close to Huntsville's main employment centers with easy access to highways and major thoroughfares. From Redstone Arsenal: Exit gate 9 and merge onto Interstate 565 W toward Interstate 65/Decatur, (about 4 minutes); take exit 9 toward Wall-Triana/Madison Blvd and merge onto Wall-Triana Highway/Sullivan St heading North; continue on Sullivan St about 1/3 mile; turn left onto West Dublin Drive - destination will be on the left (about 1-2 minutes) - 180 W Dublin Drive, Madison, AL 35758. From Cummings Research Park/Bridge Street: Turn left onto Old Madison Pike (about 1 minute), slight right onto Interstate 565 W/U.S. 72 Alternate ramp to Interstate 65; Merge onto I-565 W (about 4 minutes); take exit 9 toward Wall-Triana/Madison Blvd and merge onto Wall-Triana Highway/Sullivan St heading North; continue on Sullivan St about 1/3 mile; turn left onto West Dublin Drive - destination will be on the left (about 1-2 minutes) - 180 W Dublin Drive, Madison, AL 35758. From Huntsville International Airport: Head east on Glenn Hearn Blvd (0.3 mi); Continue onto Glenn Hearn Blvd SW (0.8 mi); keep left at the fork (0.4 mi); turn right onto Madison Blvd (about 1 min); turn left onto Westchester Dr (less than 1 minute) turn right onto West Dublin Drive; Abby Glenn will be immediately on your right - 180 W Dublin Drive, Madison, AL 35758. Abby Glenn~A Quiet Cove Apartments and Corporate Suites is located in the dynamic city of Madison, AL with a population of slightly over 41,000 residents. 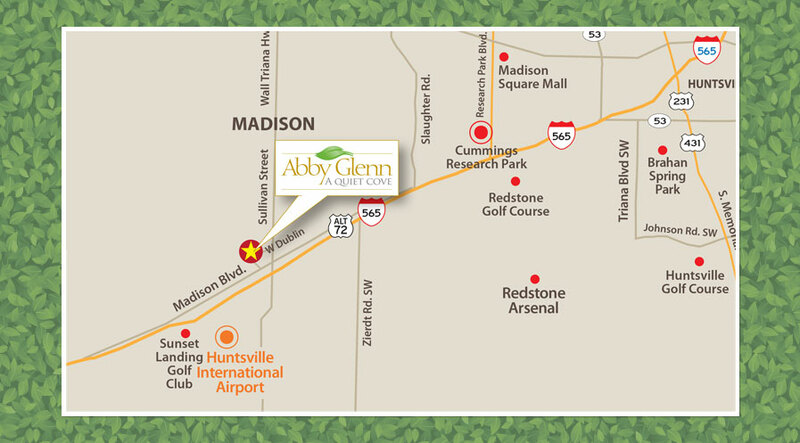 Madison is immediately west of Huntsville, AL home to Redstone Arsenal, one of the most important U.S. Army bases in the world. Redstone Arsenal serves as headquarters for the Army Materiels Command (AMC) and several additional military agencies have commands at this military base. Redstone Arsenal remains the center of testing, development, and doctrine for the U.S. Army's missile programs. This Base is a great boost to our local economy. The "Redstone Gateway," a state of the art office and mixed-use park, eventually to contain over 4 million square feet, is currently under construction at Redstone Arsenal's Gate 9; this gate is less than 10 minutes from Abby Glenn~A Quiet Cove. Huntsville is also home to the second largest research park in the United States, Cummings Research Park - also about 10 minutes from Abby Glenn. Madison itself boasts great single-family neighborhoods, highly performing schools including Bob Jones High School and our new James Clemens High School, as well as beautiful parks, walkways and recreation facilities. There are multiple shopping centers in Madison; many of them are newer facilities (2012) including a new Wal-Mart Super Center and another shopping center anchored by Target, Inc. There are several new restaurants in Madison as well. However, the most notable development in Madison is the new hospital. Madison Hospital, a non-profit healthcare provider features 60 beds but was constructed with expansion capability for up to 200 beds. This is a beautiful facility with a volunteer advisory board composed of community leaders to ensure the hospital keeps tuned-in to our local community needs. Downtown Huntsville, a short 15-minute drive from Abby Glenn, features the Von Braun Center, a multi-functional/multi-stage civic center named after the legendary aerospace engineer, Werner Von Braun. Von Braun is known as the "Father of Rocket Science" and served as the first director of NASA's Marshall Space Flight (also situated close to Abby Glenn). Von Braun was the chief architect of the Saturn V launch vehicle, the superbooster that propelled the Apollo spacecraft to the Moon and is widely recognized as the nation's leading pioneer in rocket science. Abby Glenn residents have exclusive privileges and discounts to some of the area's finest restaurants and establishments. Call for more information. In the meantime, you can click on these links to our area's schools, municipalities, public library system, local business organizations, shopping centers, local restaurant menus and more! Abby Glenn © Copyright 2013. All Rights Reserved.